During my first year living in New York, I had an “a-ha” moment that confirmed I’d made the right decision in moving here. It was small, unique, outnumbered by the “I’m an idiot for moving here” moments, like being grifted by a sad girl who says she needs cab fare but is only looking for heroin or believing you’re lucky to find a near-empty subway car at rush hour, then discovering human waste on its floor. What validated my move to New York was finding something that spoke to me, something that couldn’t be found anywhere else. It was my first Talent Family play, The Little Frieda Mysteries, and it featured David Rakoff. The Talent Family is the cheeky name taken on by the playwriting team of David and Amy Sedaris. David was just breaking out at the time thanks to The Santaland Diaries, and Amy had yet to blow the world’s mind on Strangers with Candy. Still, they were both well-known enough (at least in New York) to get their plays produced off off Broadway and to cast it with their friends. David Rakoff was probably still working in publishing at the time, but he would later join David Sedaris in the firmament of NPR and This American Life. At the time, all I knew was that the Talent Family play was equally strange and genuine, that everyone involved was hilarious and that I was lucky to be able to see it in person. Rakoff was especially brilliant in The Book of Liz (another Talent Family production), as a caring foil to Amy Sedaris’ overly sweaty cheese ball maker. That such insanity could find an audience here made New York the place for me. I never had the chance to meet David Rakoff before he passed away from cancer last year (at only 47 years old), but I always enjoyed his contributions to This American Life and his collections of essays, like Fraud and Half Empty. It also seems that David easily made friends. You can tell from The New York Times’ loving tribute, but also from the fact that over 60 people from all parts of his life showed up on an insanely hot night in Manhattan to help bring his last work to life. 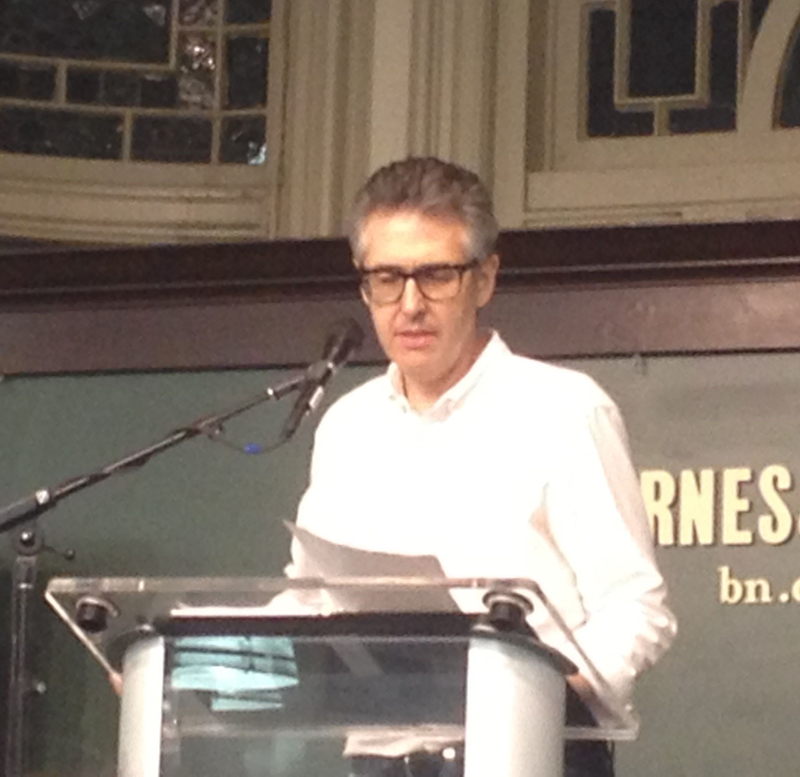 Some of the readers were from This American Life, like Sarah Vowell and Ira Glass, while others were from David’s days on the New York comedy stage, like Jodi Lennon and Jackie Hoffman. Most readers, however, were not bold names from publishing or radio, but family and friends. I’d like to think the decision to read David’s last book aloud rose from the fact that so many people were willing to read on his behalf. Of course, it takes more than love and admiration to make the reading of an entire short novel enjoyable, especially when that novel is in iambic pentameter and being read by dozens of people, some who aren’t public speakers by trade. The novel, Love, Dishonor, Marry, Die, Cherish, Perish, actually works well in this context, not just because it has the rhythm and rhyme of Shakespeare, making it sound more like a long sonnet than a novel, but because it’s a series of short vignettes, describing a small group of characters who are loosely linked over the course of a hundred years: One character shares a train car with another, whose son goes on to be an artist, whose cousin goes on to have an affair with her boss, and so on. There’s no real narrative thread, just scenes that are alternately tragic, beautiful and hilarious. Occasionally the rhyme scheme is played up for humorous or dramatic effect, but you mostly stop noticing it, especially when you’re hearing it read. slippers nearby and the proximate tissues. well, thought only glancingly — more was too scary. Inevitable, why even bother to test it? After over an hour of quiet sitting and listening (without applause, per the organizers’ request), this was the one passage that broke the audience. There were sniffles, and, when Glass stopped the recording, applause. And even though there were a dozen readers to go after that, everyone remained rapt, not just out of respect for the author, but for the work itself. The true testament to Rakoff’s work isn’t that it held the attention of hundreds of sweaty New Yorkers, but that he clearly meant a great deal to everyone in that large room, either personally or through his books or through his performances in strange plays many years ago. Love, Dishonor, Marry, Die, Cherish, Perish isn’t just a great note to go out on, but, like the reading itself, a worthy celebration of David Rakoff’s entire life, body of work and lasting influence.